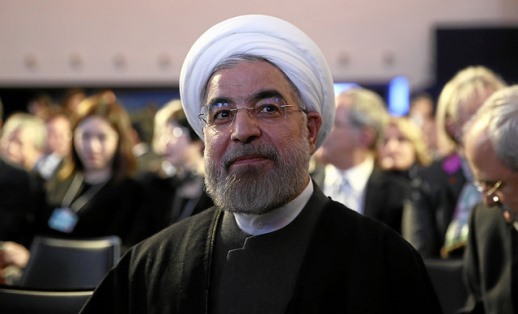 Iranian President Hassan Rouhani at the World Economic Forum in Switzerland in 2014. Christians in Iran are still regularly arrested, imprisoned and harassed despite President Hassan Rouhani’s promise of “justice” for religious minorities, according to a report launched March 10 at the UK Parliament. “All Iranian people should feel there is justice. Justice means equal opportunity. All ethnicities, all religions, even religious minorities, must feel justice,” Rouhani is quoted in the report as saying in April 2013 in the run up to his election. But in reality, nothing has changed for Christians since he came to power, states ‘The Persecution of Christians in Iran’, produced by The Christians in Parliament All Party Parliamentary Group (APPG) and the APPG for International Freedom of Religion or Belief. Christians from Muslim backgrounds face the toughest treatment. Church services in Farsi are still prohibited; only the Armenian and Assyrian minorities are legally able to hold services, but they are prohibited from using Farsi in them, even though the vast majority have lived in the country since birth. “The [Iranian] constitution recognises Christians as a minority,” said Mohammad Zamir, from Elam Ministries, speaking at the launch. “The difficulty is the conversion of Iranians. The government is very concerned because of the mass of conversions… Iranians in their thousands and hundreds of thousands are converting to Christianity. Sadeq Saba, Editor of BBC Persian, told a Parliamentary hearing in December that Iranians are converting to Christianity as a reaction to a repressive regime. The report estimates that ninety-two Christians were in prison in Iran at the end of 2014, while a further 18 spent time behind bars that year. Two weeks ago, World Watch Monitor reported the release of one Iranian Christian, Rasoul Abdollahi, a 35-year-old pastor who spent the whole of last year in prison, but that other Christians arrested the same day were still being held. 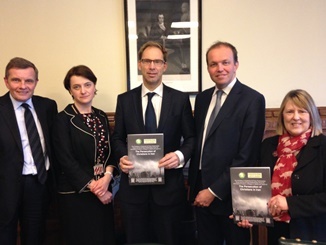 Left to right: David Jones MP, Baroness Berridge, Tobias Ellwood MP, David Burrowes MP, Fiona Bruce MP at the launch in London. At the UK Parliament, Tobias Ellwood, Minister for the Middle East and North Africa, acknowledged that the real seat of power in Iran lies with the Supreme Council of religious leaders, headed by Ayatollah Ali Khamenei. But despite another report calling into question Iran’s record on religious freedom, Khamenei was quoted recently by Mohabat News as saying that harassment of non-Muslims is “non-existent in the history of our Islamic regime”. Like Rouhani, he is said to have claimed that “followers of other religions should be treated with justice and fairness”. Yet, regardless of the claims of Iran’s leaders, evidence points to the contrary, and has for some time. Two years ago, reports by the UK’s Foreign Office and New York-based International Campaign for Human Rights in Iran (ICHRI) said there was “systematic persecution and prosecution” of Christians in Iran. “Despite the Iranian government’s assertions that it respects the rights of its recognised religious minorities, the Christian community in Iran faces systematic state persecution and discrimination,” noted the ICHRI. A statement in this week’s report from United Nations Special Rapporteur Ahmed Shaheed notes that, although Iran is party to two international treaties clearly outlining freedom of religion and expression and “although the Iranian constitution also introduces these rights… other provisions [are] either systematically limiting or completely denying existing rights protections to the country’s religious minorities”. A change of presidency had led to new hope for Iran’s Christians, but this latest report suggests Rouhani’s promises remain unfulfilled. “There has been no substantive change in Iran’s human rights record since the election of President Rouhani; in fact by some indicators you could argue that things have gotten worse,” said Ajay Sharma, from the UK Foreign and Commonwealth Office, at a Parliamentary hearing in December.